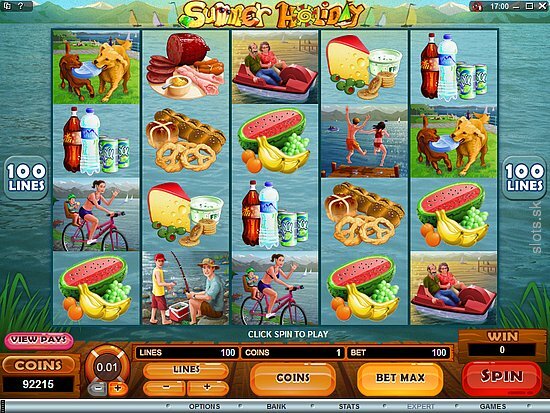 As the name indicates, the Summer Holiday is a video slot game based on a summer holiday. This is a relatively new game launched by Microgaming and boasts of 5 reels and 100 pay-lines. As only two slot games worldwide feature 100 pay lines, this is indeed a special feature of this slot game. These 100 pay lines greatly increases your chances of making winning combinations and is a main reason for the increased popularity of the game in such a short time. This is why many casinos supporting Microgaming software now feature Summer Holiday on their list of games. The beautiful combination of amazing graphics, sounds and animation in the game help you relive your favorite summer holidays with picnics and swimming pools. These effects are enhanced by its 3D symbols. Both the animation and soundtrack of the game is based on a summer day out theme with glitch-free and smooth graphics and animation. There are altogether 12 symbols in the game, divided into 3 groups based on the payouts they yield. The first group comprises of two Summer Holiday Jackpot symbols; the Summer Holiday symbol and Duck symbol which offer the highest payouts. These 5 Medium payout symbols constitute the second group- Boating Couple, Girl and baby on cycle, Fishing Couple, Two dogs and Swimming children. The last group of five low payout symbols comprise of Cheese and Crackers, Pretzels, Water and beverages, Fruits and Cold Cuts symbols. The duck is the wild symbol which helps maximize your winnings. Any spin of 3, 4 or 5 duck symbols not only triggers free spins and a 3x multiplier bonus but can also be used for completing a winning combination by substituting other symbols. On completing your Summer Holiday free spins, you can choose amongst a prize, another round of free spins or win a mystery prize of a bet multiplier anywhere between 10x and 100x. The Summer Holiday stacked wild symbol is another special symbol. It can be used to substitute any symbol to help you form a winning combination. You can thus complete pay-lines and win more cash. The symbol can appear on an entire reel and is featured in every spin. Summer Holiday however offers limited coin denomination variations from $0.01 to $0.05. The maximum bet that can be placed is one coin per pay line, making the maximum bet only $5 per spin. All this proves that this game is a low roller slot game. However Summer Holiday offers massive jackpots and despite the low bet amount per spin, the prize money potential of the game is very high. You can also adjust the speed of the game as per your preference and convenience. The most obvious advantage of Summer Holiday is its incredible jackpot and 100 pay-lines. Many people agree that its summer theme is rather enthralling and well executed. Special mention should also be given to its other advantage of free spin bonuses and pick a prize feature. Despite these great advantages, there are some disadvantages associated with Summer Holiday. One disadvantage is that it has no scatter symbol and another, that it does not have a bonus round on second screen. Its poor choice of coin denominations is also considered a disadvantage by many.